Do you love digital worlds and video games? Then you’ll love Gamer’s Group where you can PLAY OR CREATE! 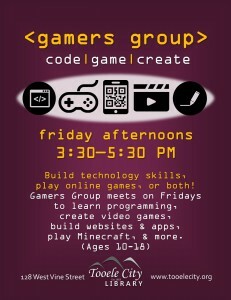 Every Friday, you can learn how to program computers, play games like Minecraft or Roblox – the choice is yours. Basically you can have tech fun in your own space… all while gaining tech skills for your future. Coding and gaming is all self-paced, so just attend on the weeks you can. Registration is not required. A computer is provided during club time. And you can bring your own laptop if you’d like. Open to ages 10 – 18.